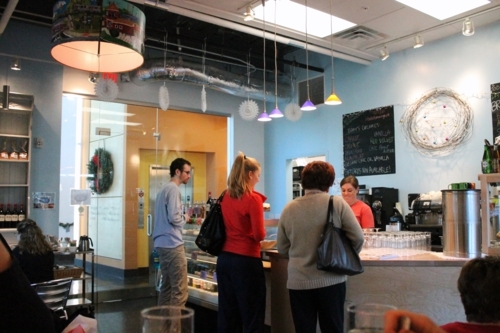 Hummingbird Bakery is Amy Tornquist’s, chef of Watt’s Grocery, newest venture. Watt’s is one of my go-to recommendations for dining in Durham. As a lover of all things dessert, coffee, and Watt’s Grocery, I was looking forward to trying out Hummingbird. It’s housed on the first floor of a multipurpose building across from Duke’s East Campus. 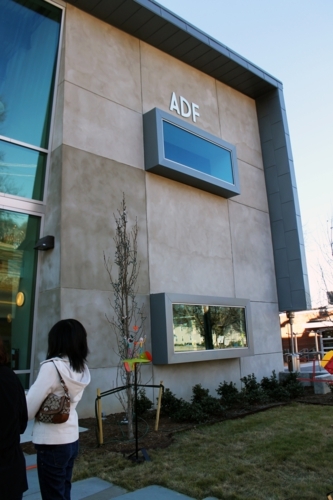 A large sign for the ADF is the most identifying feature on the building beyond its unique architecture. The bakery is housed on the first floor to the right. Seating is somewhat cramped, though I think they have more outdoors options on nice days. Hummingbird continues the trend of using shades of blue for bakeries like Sugarland, Scratch, and Piebird. Did I miss a memo on the required use of pastels with sweet treats? I’m just noting the trends, folks. Nothing wrong with robin’s egg blue. Hummingbird’s logo is a manic scribble of a nest that provides a dose of whimsy, and the general impression I had of the interior was cute. The display case houses a wealth of cupcakes and other desserts like small chocolate meringue pies that I really should have tried. 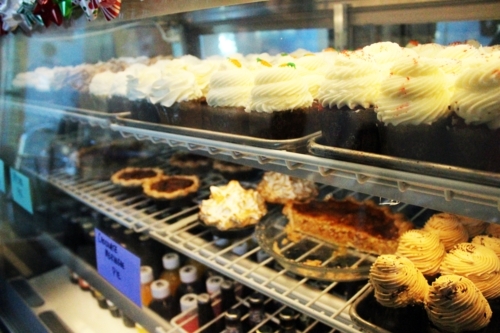 Baked goods are housed on the far end of the counter and seem to go pretty fast. 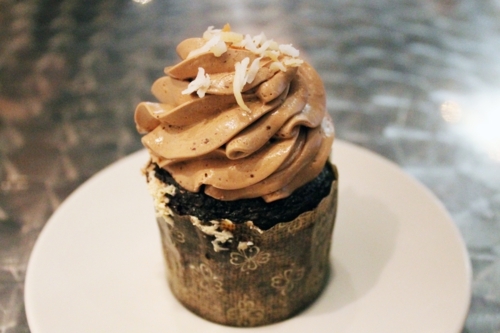 I chose to start my meal with a cupcake. The chocolate-almond buttercream frosting was drooping, so I ate dessert first. Who am I to let sweet things sit until after my meal? Almond Joy was the cupcake’s theme. Although melting, that frosting was delicious. The chocolate cake was a tad dry and had a coconut center that would have been more of a player if twice the size. The size of the cupcake itself was enough for two people. A sprinkle of almonds would have been welcome in keeping with the theme. 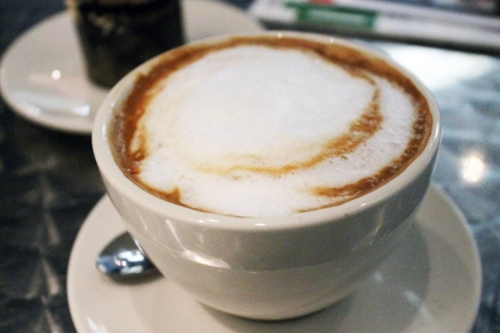 My cappuccino was average, lacking barista finesse but tasting fine all the same. It was also heavier on the milk than is my preference. It’s worth noting, because it’s unclear from the menu and the cashiers don’t ask, that you can choose any of the sides offered that day to go with your sandwich choice. 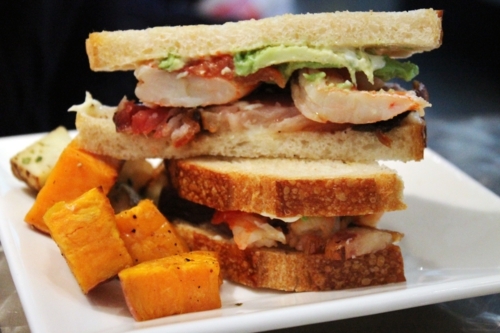 One of my companions had the shrimp BLT. It looked scrumptious, and she had no complaints beyond wishing she had remembered to choose a different side because sweet potatoes are not her favorite vegetable. I loved the roasted potatoes and thought them perfectly seasoned with herbs and salt. 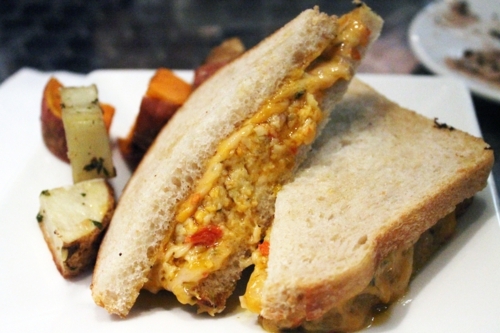 I had the pimento cheese sandwich, which came on sourdough. Roasted poblano and red peppers were finely diced up and mixed into the pimento cheese spread. They tasted great, but I think the sandwich would have been better served with strips of them rather than diced so they had more presence. The sharpness of the cheese was welcome. It almost hurts me to say it, though, especially with good sourdough bread, but the sandwich was way too greasy. The pimento cheese spread congealed fast, leaving grease shining from all angles, and it wasn’t appetizing to look at. So if you order it, my advice is to eat rapidly. 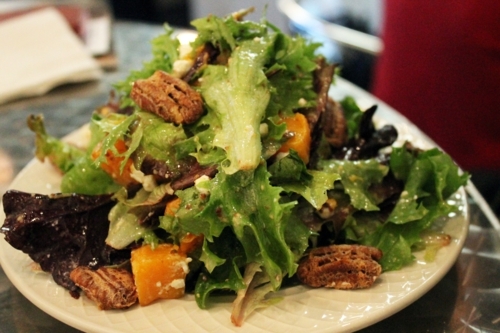 My second companion had a lighter meal, choosing a winter salad with roasted butternut squash and candied pecans. It was overdressed, but all elements of the salad were vibrant. 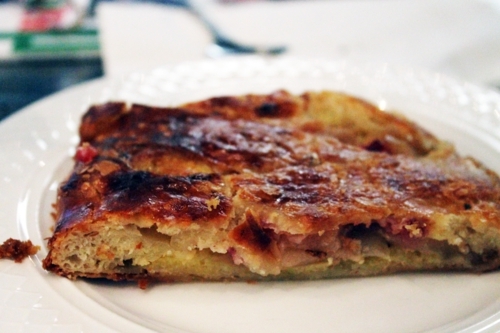 We finished our lunch with a cranberry-pear danish from the bakery case, which was my favorite part of the meal. Hummingbird is a great bakery and lunch option in Durham, though I think the pimento cheese sandwich could be refined and the cupcake quality was closer to good than great. But it has a lot of potential, and the sides and that danish were memorable enough to bring me back again. Plus, I must try the chocolate meringue pie.